The Milky Way can be thought of as a massive city of stars. It’s home to roughly 200 billion stellar inhabitants, and scientists have been working for centuries to map and study every last one of them. Like an ongoing census of the sky, astronomers spend their careers venturing into our galaxy’s deepest neighborhoods — and let’s face it: if you spend time wandering around a huge city, you’ll encounter a few weirdos in the process. Our galaxy is no exception. The idea of stars covered in metal clouds sounds like a premise for a bad 50’s sci-fi film. Be that as it may, they aren’t sci-fi at all. These exotic stars are actually a type of white dwarf — the small, super-dense remnants of ancient stars like our sun. By “super-dense,” of course, we mean that a teaspoon of material would weigh about 15 tons (over 13000 kg). Crazy, right? Now imagine the same freakishly dense object, only its covered in metallic clouds. Unbelievably, stars like this actually exist. It’s worth noting that the term “metallic clouds” may be a bit misleading because clouds on a white dwarf don’t remotely resemble clouds on Earth. Here, clouds form as white, fluffy collections of water vapor; But on these unique stars, their super-high density and surface gravity create metallic clouds — usually composed of lead and zirconium, with other types in lesser concentrations — 100 km thick, weighing up to 100 billion metric tons. Astronomers think the clouds can cover most, if not all of, a star’s surface, probably taking on a bluish-hue. No one knows for sure how they appear up close, but their existence alone is undeniably jaw-dropping. Most of us have seen Vega, the 5th brightest star in the night sky. But up close, Vega looks nothing like a typical star. It rotates so fast — over 600,000 miles per hour at the equator — that it bulges into an oblate, ovular shape, kind of like a chubby blue egg. Scientists estimate that Vega is spinning at about 90% of its maximum possible rotational speed. It if were turning just 10% faster, the spin would overwhelm Vega’s gravity and rip it apart. 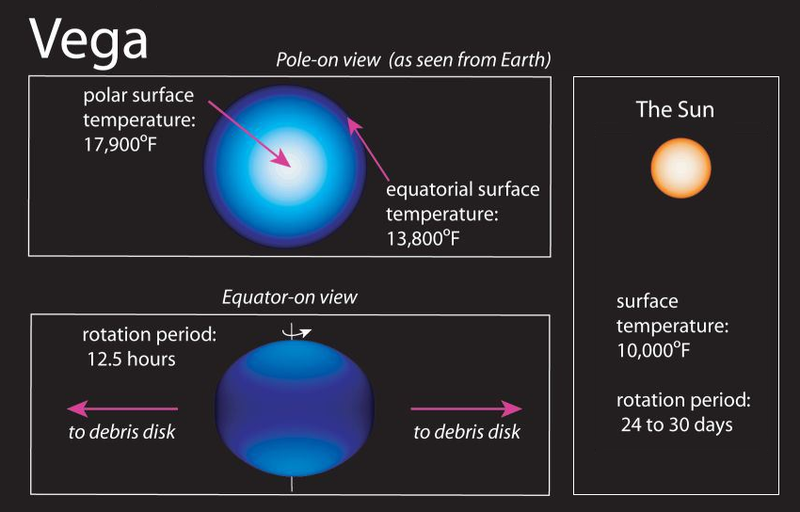 As if being egg-shaped isn’t odd enough, Vega doesn’t shine evenly like our Sun either; rather, the star’s bulging equator shines less brightly than the poles, giving it a darkened stripe on its surface. Scientists think the stripe is a result of temperature variations caused by Vega’s insane rotational speed. Since the equator is cooler, it shines less brightly, giving it a darker color in contrast with the poles. In other words, not only does Vega look like a blue egg: it looks like a striped, decorated blue Easter egg. Think about that next time you spot the constellation Lyra, where Vega outshines nearby stars ,and hides its bizarre secret from the unaided eye. Binary star systems are common in our galaxy. In fact, scientists estimate that 85% of stars in the Milky Way are found in multi-star systems. But two stars actually touching each other? As impossible as it seems, the binary system MY Camelopardalis is doing just that. These two hot blue stars are literally rubbing against each other as they orbit around a common point. Astronomers believe MY Camelopardalis is about to merge into a single supermassive star. When the merge finally happens, the result may be a spectacular explosion of energy. Or it could simply create a larger star that rapidly burns through its remaining fuel supply; No one can say definitively. Spiral arms are usually associated with entire galaxies, but the star SAO 206462 is unusual in the fact that it has its own set of spiral arms — each spanning 14 billion miles across (twice as long as Pluto’s orbit around the Sun). As strange as it might sound, astronomers posit that we are looking at a protoplanetary disk, where new planets are forming. The existence of the disk itself isn’t weird or uncommon — in fact, protoplanetary discs are frequently spotted around young stars in our galaxy. But its shape is unique, even among similar discs. 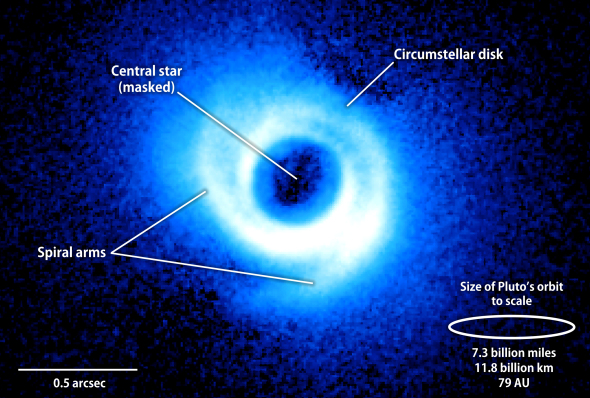 Scientists have previously found rings, divots, and gaps in disks around other young stars, and they believe the shapes are created by the force of gravity. In SAO 206462’s case, scientists believe each spiral arm contains one new planet. The discovery of the spiral arms was both unprecedented and totally unexpected, demonstrating that new scientific discoveries can lie hidden even in well-traversed areas of research. HV 2112 should probably be renamed “The Cannibal Star.” This cosmic beast is actually a giant star with a separate neutron star buried in its core. Scientists think that it was originally a binary star system, consisting of a red giant and a neutron star, until the latter was swallowed by its larger companion. The final result of this cosmic cannibalism is a Thorne-Zytkow Object, a monstrosity so bizarre, it literally redefined our notions of what can constitute a star. Remember, HV2112 is a two-piece combination: a neutron star inside a red giant. These two things are already extreme independently of one another. Remember how a teaspoon of white dwarf material weighs upwards of 15 tons? 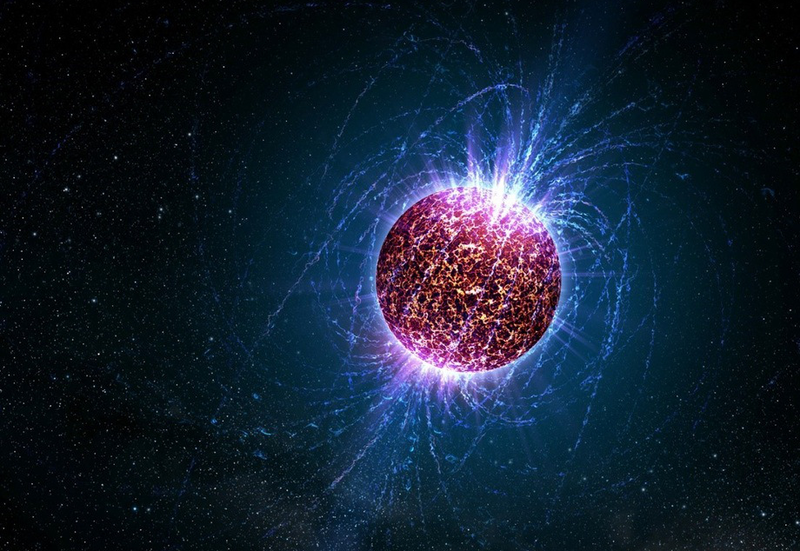 Well, a teaspoon of neutron star material can weigh up to 4 billion tons. Yes, that’s 4 billion tons of material compressed into a space no larger than a sugar cube. And a red giant? A red giant star can have a diameter of hundreds of millions of miles. If a red giant were placed in the middle of our solar system, its surface could easily extend beyond the orbit of Mars. Combining these two stars creates something unlike anything previously known to science. But this star isn’t just unique for being a freakish two-star hybrid. HV 2112 is special because it behaves differently than a conventional star. Its exotic makeup causes it to manufacture elements in a different way, creating higher concentrations of specific heavy elements; This has the potential to change our understanding of how heavy elements can be produced in nature — up until HV 2112’s discovery as the first probable Thorne-Zytkow object, scientists believed that heavy elements were likely created exclusively in the cores of massive-but-otherwise-traditional stars and in ancient supernovae. By merely existing at all, HV 2112 has forced science to rethink some of its most fundamental assumptions about our universe.